« Cosmic Sai Baba lunatic fringe mediums, channellers et al. Prime Minister Narendra Modi has suffered a seismic electoral defeat in the Delhi Legislative Assembly election Delhi, something the Bharitiya Janata Party (BJP) never even suspected was possible. It was the Aam Aadmi Party (AAP) led by Arvind Kejriwal secured 67 of the 70 seats. Congress won nothing and BJP the remaining three seats. This party has anti-corruption high on its agenda. Vesides, the AAP ran a clean campaign. not descending to the defamatory smears of some opponents. 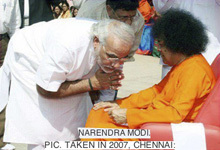 This entry was posted on February 11, 2015 at 11:15 pm	and is filed under Sathya Sai Baba. You can follow any responses to this entry through the RSS 2.0 feed. You can leave a response, or trackback from your own site.